One of the many images floating around promoting leaks on the iPhone 7. The upcoming iPhone might be the last one to feature a home button, according to a new report. The 2017 handset - long rumoured to be a far bigger upgrade than any in previous years, including the iPhone 7 - will just be one big sheet of glass on the front, according to a Bloomberg report. That will be achieved by dropping the home button that has sat on the bottom of iPhones ever since they were first released in 2007. As such, it will likely bring a whole new design to the phone - which has previously been marked out by the iconic round shape at its bottom. Without the home button, the whole front of the phone will be able to function as a screen. The home button would presumably either be integrated into the software, or be added as an invisible button at the bottom of the phone. The 2017 iPhone will be the tenth anniversary edition, and is as such expected to include more changes than normal. This year's iPhone - due to be unveiled on September 7 - is thought to be more of an "s" year to get ready for a much bigger update next year. Next year's phone is also thought to bring with it a third, premium smartphone alongside the normal line - perhaps the long-rumoured "Pro" model of the phone. That will include a curved screen around the side, like Samsung's "Edge" phones, according to reports. The iPhone 7 is widely rumoured to keep much of the same design. But it will include a little home button change of its own: Apple is widely expected to get rid of the actual button at the bottom of the screen and swap it instead for a flush one that doesn't actually press, and instead simulates a press with vibrations. Other than that, the new phone is expected to remove the headphone jack from the bottom of the phone, and include big upgrades to the camera. Apple has sent out invites to selected media to join them in San Francisco's Bill Graham Civic Auditorium on Wednesday September 7th. It is highly likely that a second-generation Apple Watch will also be revealed at the launch. Pre-orders for the iPhone 7 family of devices are expected to open on Friday September 9th, with sales to commence one week later on September 16th. Tim Cook faces a big job in selling the iPhone 7, especially given that rivals have similar features already in the market. Samsung's Galaxy S7 has one of the best cameras on the market at the moment, while Huawei debuted a dual-lens cameras earlier this year. The loss of the 3.5mm headphone jack won't be popular with some fans. Consumers will have to rely on bluetooth equipped headphones, or headphones using lightning jack from Apple's Made for iPhone program. 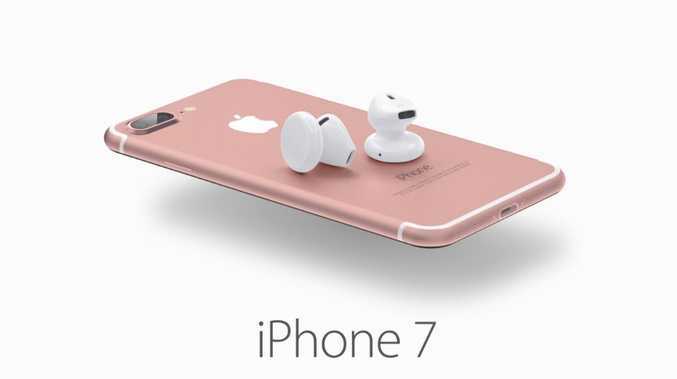 Apple iPhone 7: Who cares about a headphone jack anyway?